It is some time since the last blog and much water has passed under the bridge. The annual Kite Festival was held over the Easter bank holiday weekend and this has now become a fixed feature of our calendar. There was a variety of synchronised kite flying demonstrations and a selection of kites were on display. Kite building workshops were also held. Our reputation for arts and music continues to grow and we have now held six significant art exhibitions in the Latimer Room with a planned programme lasting until June 2018. Monthly exhibitions in the Breakwater Café continue to attract considerable interest. Eliot Smith's Dance Company has proved so successful that we are hosting a rehearsal session in November that will be open to the public. KEAP Creative held another raku workshop and demonstration which went down very well with demands for a repeat which we will undertake to fulfil in due course. Negotiations are underway to host the 2018 Highlights Craft Tour. We have hosted this in the past but withdrawal of funding a few years ago saw its demise. The North of England Civic Trust organised a series of Heritage Skills Initiatives where traditional craftspeople demonstrated their crafts. The Maritime Centre, on behalf of Newbiggin Heritage Partnership, was pleased to host a number of these as part of its contribution to the community. The MGB club assembled in June before driving off to Durham. This gave enthusiasts an opportunity to appreciate a variety of well cared for classic vehicles. A defibrillator has been donated by Newbiggin Town Team and was installed on the promenade in April. While we hope it does not become necessary it is there to provide a valuable emergency service if required. Newbiggin Cooperative Society presented NMC with a significant donation to enable us to provide an afternoon tea on 5th July for those residents living in sheltered accommodation or by themselves. 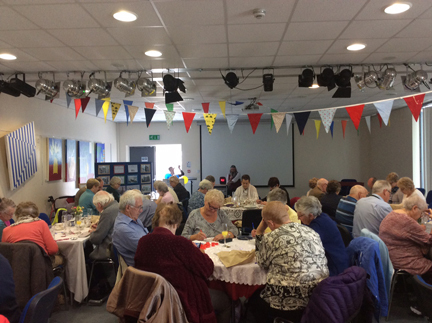 The afternoon was well attended and much appreciated and was accompanied by a slideshow of the Rocket House Restoration, background music and bingo. The Film Club goes from strength to strength and has recently published the programme of films for the 2017-2018 season. Buskers Night on alternate Wednesdays is very popular and continues to attract an eclectic mix of performers. The Rocket House restoration has now been completed and will be open to the public from August Bank Holiday weekend. NMC will make a significant contribution to Newbiggin Festival over the August bank holiday weekend and it is hoped that this will become an annual fixture. The programme of events continues apace and it is obvious that much is provided for the community.